Straightforward, self-adjusting, and heat-tolerant. Will it see production? 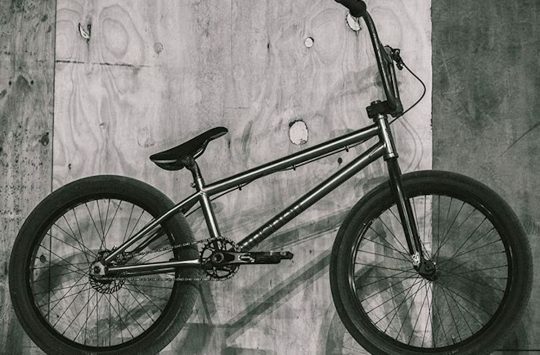 Given the long history of the sport of cycling (to say nothing of motorsports’ parallel products), it’s not surprising that there are few truly new concepts floating in the ether, just looking for the right noggin to land in. All the same, when we came across Australian Crisp Engineering’s modified scissor-type brake caliper, the concept was so elegant that we wondered why it hadn’t been tried on discs earlier. 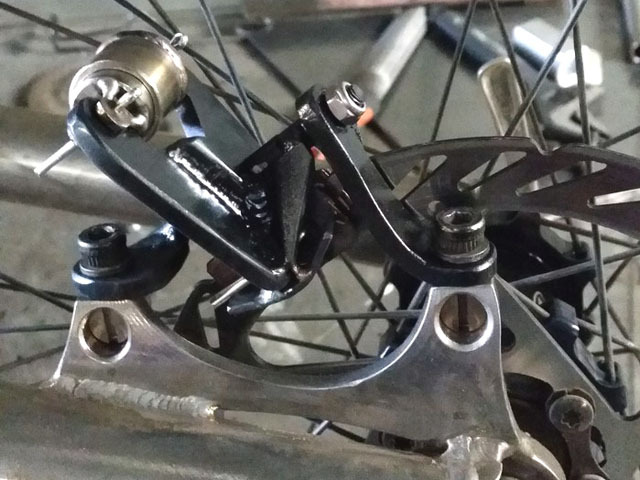 Hey- when was the last time you belt a disc caliper from scratch? Looking very much like a Magura HS77 road bike caliper that’s seen the angry end of a shrink ray, Crisp’s disc caliper uses a single hydraulic slave cylinder to spread its arms, which in turn drive a pair of pads to the rotor. Easier seen than explained, the design is very straightforward, claiming to address several issues with current models. Without more common designs’ pistons, there are fewer seals to leak and less liklihood of a sticky piston causing uneven pad wear. As the pads and much of the mechanism is exposed to the air, there’s plenty of opportunity for braking heat to dissipate before causing any hydraulic fluid to boil or otherwise degrade. The rough prototypes seen here aren’t necessarily pretty- but they are a solid proof of concept and are functional enough to have allowed designer Allan Crisp to ride them in a local enduro event- on his rigid singlespeed. Crisp’s CAD renderings look considerably more substantial- though are said to weigh a competitive 110g (roughly the same as a current Shimano XT caliper). 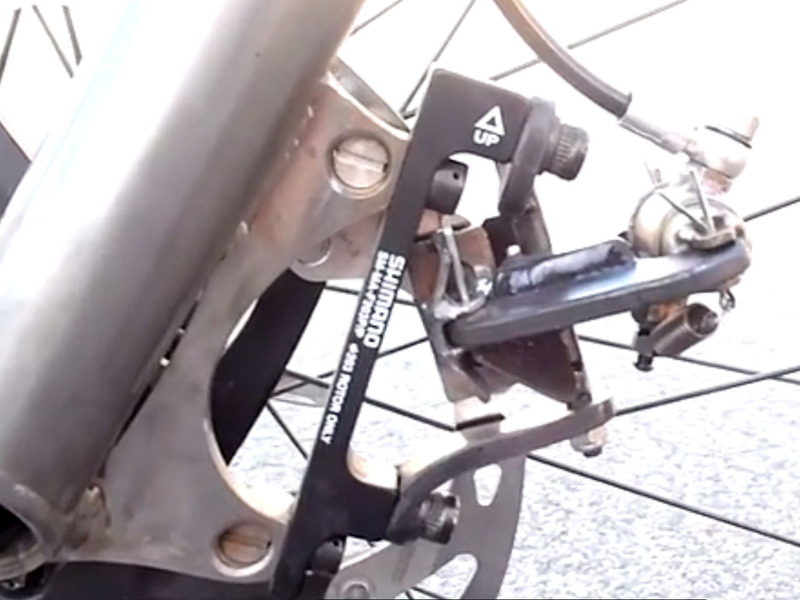 The design is said to work with Shimano hydraulic brake levers- though Crisp is also working on their own. The floating design is said to be self-aligning- which, depending on how the system is set up, could conceivably be effective at accommodating bent rotors, rub-prone and noisy, or both. 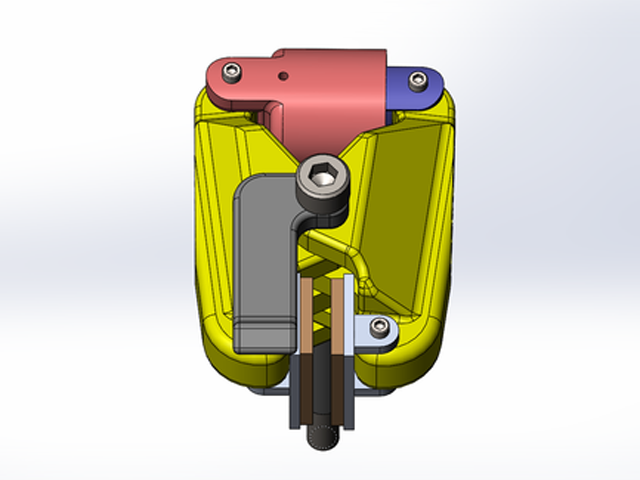 Because the pads travel in an arc, the top edge will, at rest, sit closer to the rotor than the bottom edge- but with the right amount of friction in the mount, this could also be an effective self-alignment feature. Come replacement time, a simple pin is all that holds the pads in place and access should be very straightforward. As any engineer will attest, the heavy lifting comes between concept and series production, so while the idea may have merit, execution will be what makes these brakes successful- or unsuccessful. Crisp’s project is currently seeking funding via Kickstarter- though is 98% shy of its goal with five days left. 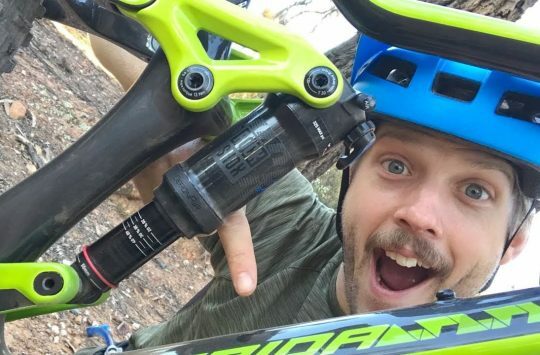 While further development and demonstration may be needed before crowdfunding is a viable option, it’s encouraging to see mountain bike tinkerers continuing to build and try new ideas. More at Kickstarter and Crisp Engineering’s website. 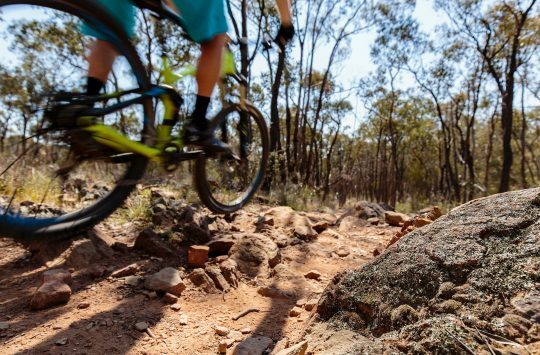 Cannondale FSi - the fast hardtail reinvigorated. Very interesting. Any relation to Darren Crisp (Amero-Italian Ti frame builder)? Looks like it could be one of his forks. I’d say elegant in concept, but the execution looks a bit Heath Robinson. It does appear to be a bit exposed too, not sure about its longevity in muddy gritty slime typical of a UK winter. Would this be one of those things that works wonderfully well in a dessert enviroment, but fails miserably in the UK? Its an interesting idea, but it would need to show considerable benefits in price / function / weight over established brands to the customer to persuade them to try something that different from established brands. First thoughts are that the oil is further from the heat, and there’s room all around the pads for air flow… cool! I’m not clear what ensures the pad retracts properly though, and don’t pivot so that one edge is in contact with the pads causing rub. And rattle? No pudding jokes from me. Realistically though, who these days actually overheats the oil in their brakes? Sure, the pads maybe, but the oil as well? I doubt even an Enduro Angel would be Delighted by this one………. I think its the seals that pull the pistons back in. Pads will be more expensive to manufacture due to the tabs needed to be welded on. Play will develop in the pivots due to the forces used. A small stone could get in between the jaws compromising braking action. 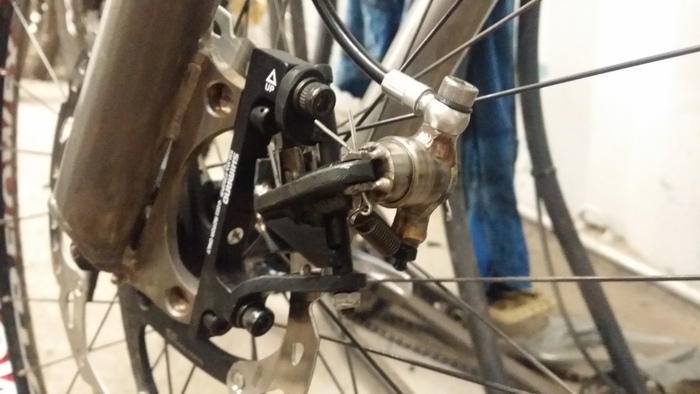 Generally more moving parts is a bad thing and whats wrong with standard caliper brakes anyway? 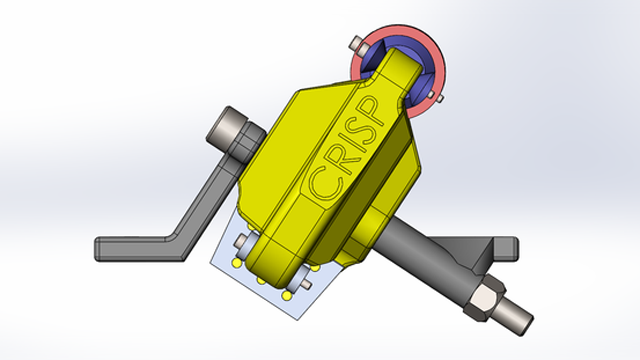 Well done and good luck to Crisp Engineering for adapting some existing ideas and developing something different. Scissor callipers are used across many forms of transport, from bikes to high speed trains. Prototypes aren’t supposed to look polished and finished: there’ll be time to refine them later. Anyhow; what would we do without innovators (ride rigid single speeds, probably)?